In an industry with very little differentiation, LifeFone stands apart from its peers with unique technology, one-of-a-kind services and stellar plans. More than just medical alerts, LifeFone offers a sweet of optional caregiver services including activity checks, daily check-in calls, medication reminders and location tracking services. They also give you the option to monitor smoke, fire and carbon monoxide remotely. We don't see any of LifeFone's competitors, including market leaders like Philips Lifeline, Life Alert, Medical Guardian or Bay Alarm Medical, offer anything close to the level of caregiver tools, alerts and consumer friendly plans offered by LifeFone - if at all. To top it off, LifeFone offers a great 30 day free trial period, with a no questions asked cancellation policy thereafter - without the fine print. Not only that, LifeFone is currently offering free shipping, free activation and a free lock box on ALL plans - there's absolutely no risk to giving it a try. Medical Alert Equipment: LifeFone offers all the standard and optional equipment you want from a medical alert system. From basic landline, to in-home cellular (for those without a landline) and out-of-home mobile medical response. In addition, you can get automatic fall detection and GPS location tracking. Personalized Emergency Care Instructions: This is where a medical response company really proves its worth. With LifeFone, an agent will help you design an emergency protocol, which can evolve as your needs change. This includes who to call in which situations, your medical history, medications, allergies, physicians, family members, neighbors, your preferred hospital and more. Unlimited Emergency Contact Notifications: Some medical alert companies put a limit on the number of contacts the monitoring center is obligated to notify in the event of an emergency. LifeFone has no limits. In the event you press the pendent button and emergency responders are dispatched, you can automatically notify as many of your siblings, children or friends as you want. Free Couples: You can protect a second person in your home for free. This is a feature not many medical response companies provide. However, with LifeFone, the monitoring center will keep a second set of emergency protocols (medical history, allergies, etc...) for a spouse, free of charge. Activity Checks: We love this feature. At a pre-set time, LifeFone will send a beeping tone through the medical alert base station every day. You can turn off the beeping tone by pressing the emergency button, which lets the monitoring center know you're ok. If you don't press the button within 15 minutes, the monitoring center will call you and if there's no response they will engage emergency protocol. The feature only costs $6 a month. Daily Check-in & Reminder Call: You can schedule LifeFone to call your loved one at a pre-set time everyday. LifeFone will call, check-up on your loved one, and give them whatever message you want, including medication reminders. This feature costs $19 a month. Automated Medication Reminders: The base station can be programmed to remind you when to take your medications and which medications to take. You can remotely upload up to 4 reminders a day, with up to 10 medications per reminder. You then press the base station to record that you've taken your medication. The service will keep an online record of when medications were taken or missed. This feature costs $6 a month. Location Service, Medication Reminders & Notifications: For a total of $9 you can get all three services. The location service, allows you to access the location of your loved one 30 times per month. LifeFone will track the location of your loved one throughout the day, so you can find the current location of the device and the last 4 locations of the device, from newest to oldest. This service is a little different from many emergency medical alert systems that only engage GPS tracking when the user herself presses the emergency button. Remote Phone Answering: How many times have you missed a call because you got to the phone too late? The LifeFone base unit allows you to answer incoming phone calls by pressing your pendant - no more running to the phone. You can speak to your callers from across the room by activating LifeFone's two-way speaker base unit. Water Resistant: LifeFone is fully water resistant and can be used in the shower, bath, pool or sink. Easy Installation: Like most medical alert systems, we found LifeFone easy to install and use - no expertise required. A Real Risk Free Trial: LifeFone offers free equipment, free shipping, free activation, pricing for life, 30 day free trial period and free cancellation at any time. After the 30 day free trial period, you can cancel at any time and only pay for the service you used. Some providers lock you in for a full year, others offer watered down cancellation clauses that only let you cancel after 3 months - LifeFone is clear, transparent and honest. Free Key Lock Box on ALL Orders: LifeFone offers a FREE key lock box with every order. Never get locked out of the house again and avoid emergency responders breaking down your door! 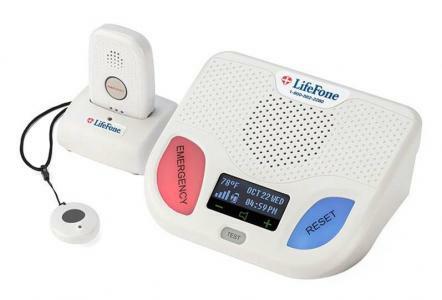 Two Systems For The Price of One: LifeFone is the ONLY company we know of that will give you a FREE base station and pendant for use inside the home, when you get the mobile medical alert system. LifeFone does this for two reasons. First, mobile systems are notoriously patchy indoors. Second, all mobile systems have to be recharged - just like a cell phone. With LifeFone you have access to an emergency pendant at all times, even when recharging!